Luthier John Degay is based in Bexhill on Sea, East Sussex and has been making and repairing electric and acoustic guitars for over 30 years. John was also a close personal friend of the legendary British luthier, Tony Zemaitis. All acoustic and electric Degay guitars are custom built and made to your specifications and design. Therefore no two guitars are the same - guaranteeing that you will own a totally unique guitar. John Degay also provides a guitar repair service - from simple repairs to complete renovations. Recent commissions have included major renovations of some very old vintage Zemaitis Guitars. To ensure quality, only the best woods, materials and components are used. John knew Tony Zemaitis for over thirty five years. During that time he helped Tony with various projects and specialist services including polishing, engineering, wiring electrics and even guitar case making. This close relationship with Zemaitis gave John a fantastic insight to how Tony worked. John has also been given permission by Tony's widow to make guitars in the style of Tony Zemaitis. 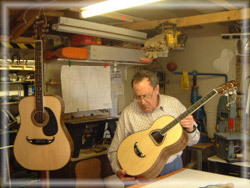 Contact John De Gay to discuss commissioning a handmade acoustic or electric guitar or repair.